One of the most profound effects of the Spanish conquest of Mexico was the encounter of the Spanish and Nahuatl languages. This began from in the first confrontation between Motecuhzoma and Cortés, in the spectacular setting of the lake city Tenochtitlan, capital of the Aztecs (pic 1). Motecuhzoma, the Aztec tlatoani (literally “speaker”) or king, addressed Cortés in a lordly speech, reflecting the norms of the huehuetlatolli, “the sayings of the ancients”. These were part of the long-standing syllabus at the calmécac “the house of the lineage”, a school for the sons of Aztec nobility. 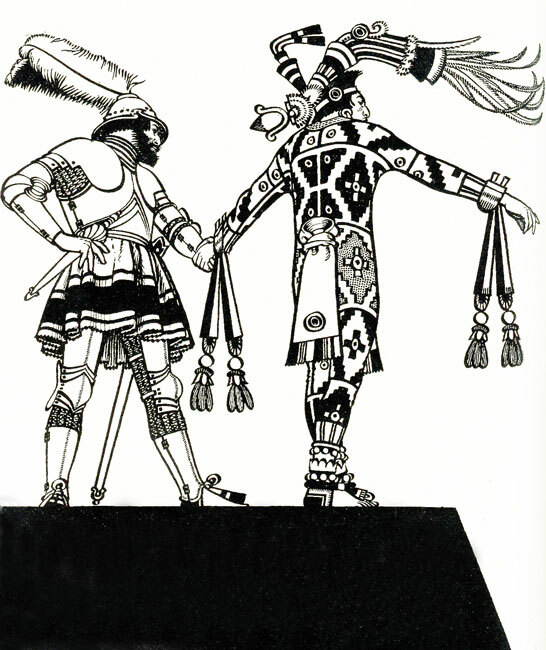 This was conventional greeting, although there would have been few whom the tlatoani of all Mexico would address as teukyoe “Lordship”. The language was, of course, completely unintelligible to Cortés, but he was fortunate to be given a running interpretation, by courtesy of a couple of bilinguals who worked in tandem. The Nahuatl [nawatl] language has a name that literally means “speaking up, eloquence”, and was the native speech of the Aztec nobility, as well as many other allies, and some peoples not subject to them (including even their inveterate enemies the Tlaxcala). It was not spoken universally even in the realms where the Aztecs claimed sovereignty. 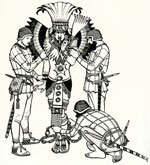 Instead, the Aztecs had planted officials, especially tribute overseers, in all the major cities, and ensured that the subject peoples provided a corps of nauatlato, “interpreters”, to ensure effective transmission of the rulers’ wishes. 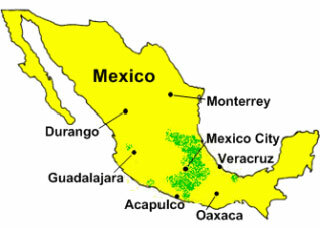 Before the Spanish conquest, Nahuatl should thus be seen as at best an effective lingua franca of a multinational and multilingual empire: the empire included areas where the indigenous population to this day speak Zapotec, Mixtec, Tarascan, Otomí, Huastec and Totonac languages, none of them related to one other or to Nahuatl. Cortés’s interpreters were Gerónimo de Aguilar, a Spanish friar, and Doña Marina, originally Malinalli Tenepal, a young woman who spoke Nahuatl natively. Gerónimo had suffered shipwreck on the coast of Yucatan, and spent 8 years in captivity with Mayans: he therefore knew Spanish and one dialect of Mayan. Doña Marina, known in Nahuatl as Malin-tzin (with an honorific suffix), had grown up speaking both Nahuatl and another Mayan dialect. 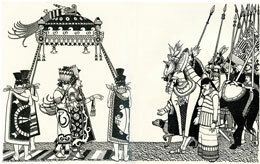 She had acquired her Nahuatl in Coatzacoalcos, on the Caribbean coast 50 km south of the border of the Aztec empire. But later in childhood, she had been traded to Xicalango, close by, but in a Mayan-language area. She had subsequently been among 20 slaves given to the Spanish victors by natives of Tabasco after losing the battle of Centla in 1519. 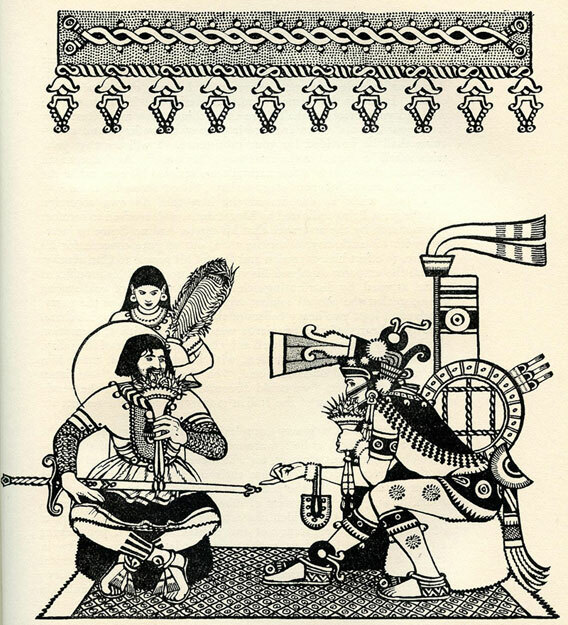 It was possible therefore for Malin-tzin and and Gerónimo working together (pic 4) to mediate between Nahuatl and Spanish, with some kind of Mayan as interlingua. Later, Malin-tzin was able to learn Spanish herself. She continued as interpreter (and some say, counsellor) to Cortés for some years thereafter. She may have been the first bilingual in Spanish and Nahuatl, and ca 1522 she became the mother of Cortés’s son Martín, one of the very first Spanish-Nahuatl mestizo children. 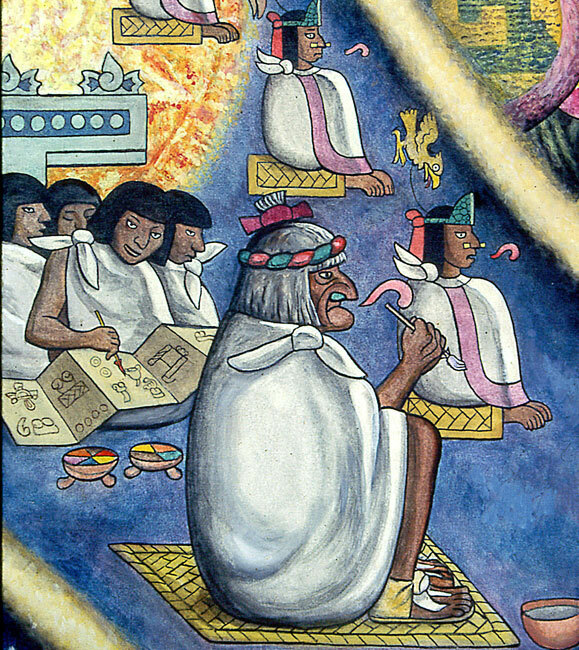 This first encounter of an exchange of thoughts in Nahuatl and Spanish was fraught with difficulties, resulting both from the high political and religious significance of what was being transmitted, and also from a distinctive discourse strategy that was customary in Nahuatl, and which Motecuhzoma perhaps could not avoid in his own speech. 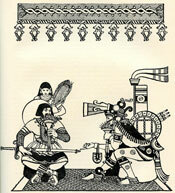 The tlatoani addressed Cortés as if he, the Spaniard, were a long-awaited lord returning to take up rightful possession. This mysterious offer of fealty would have seemed inexplicable to Cortés (suspecting perhaps a mistranslation?) and yet remarkably convenient, if he were to take it at face value. He could not know that it was the Nahuatl practice, in rhetoric, to use affectionate endearments as symbols of actual respect, even at the highest level. So much so, that we still do not understand quite what the intended effect was, when deference was expressed, as here, so humbly. A royal attempt at irony to make the interloper feel ill at ease through the evident inappropriateness of what was being said? So immediately, after a mention of an imperial master, there was talk of Christianity, and the obligation to accept it (whatever it may be), and the saving of souls (whatever that might involve). Relations did not break down at this stage. But it may be that the exchange of diplomatic civility (drawn out even longer by the need for two stages of serial translation for each utterance) was part of what caused Motecuhzoma fatally to lower his guard. 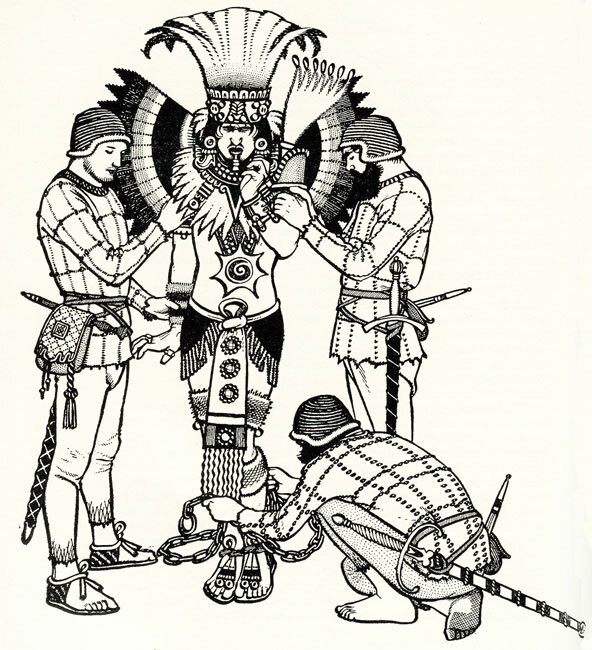 Six days later, dismissing his own guards, he delivered himself into Cortés’s power: the result was that he was held captive by foreigners within his own capital city, a tactical mistake from which he – and the Aztec empire – never recovered. The Spanish conquest took its course, as incredibly some 300 men took total control of the Aztecs’ empire of millions: the first, seemingly miraculous chapter in the saga of a whole continent’s surrender to European adventurers, fortune-hunters and missionaries. The major channel by which Nahuatl, and its dozens of language peers in Meso-America, became known to the new Spanish masters and their agents was the institution of mestizaje, mixed unions that generated families of children bilingual in Spanish and some other language. They would have arisen naturally as the Spanish immigrants, overwhelmingly male, took Indian wives or mistresses (mancebas) and began to raise families with them. Among the famous conquistadores, almost every one had mestizo children, often with several different women, and (in these cases at least) they were fully recognized as heirs to their fathers. Cortés, Pizarro, Benalcázar, Alvarado all conform to this tradition. There were large numbers of less celebrated Spanish men who did the same. 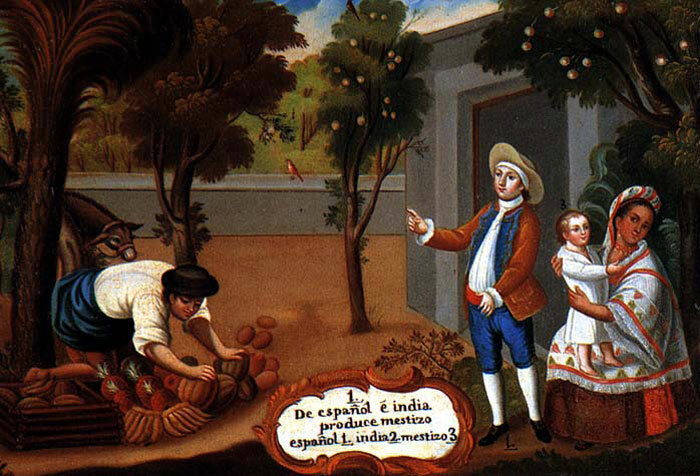 Combined with the school education that the Spanish began to supply to the children of elite Nahuatl-speaking families, this actually led to something of a literary flowering. 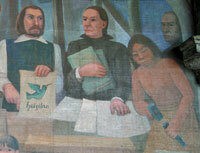 There were not only interpreters, but also literary translators and authors. Fernando de Alva Ixtilxóchitl (d. 1648), from the line of the kings of Tezcoco, sometime allies of Cortés, was known as the “Livy of Anáhuac”, author of the Historia Chichimeca (Livy being one of the most celebrated Roman historians, Anáhuac “water edge”, the Aztec name for the central basin of Mexico). 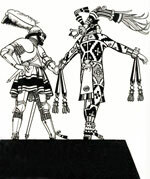 And his brother Bartolomé adapted into Nahuatl two popular Spanish plays by Lope de Vega, and another by Calderón (late 17th century). 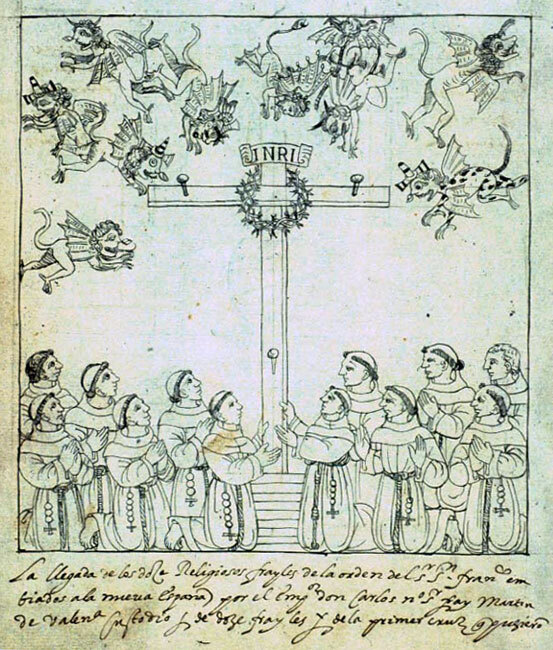 The literary use of the language continued until 1704, when in a drama entitled “Discovery of the Holy Cross by Saint Helena”, Manuel de los Santos y Salazar imagined the yearnings of the Roman emperor Constantine to see the true God, and the triumph that the miraculous cross gave over the machinations of the Devil – himself depicted as Mictlanteuctli, Aztec god of the underworld. The maxim that the first Christian emperor famously received, In hoc signo vinces “In this sign you will conquer”, here appears in Nahuatl form: Huel yca ynin machiotl titexicoz: but the verb at the end means not so much “conquer” as “trick, outwit”. But besides “natural increase” of bilingualism after the conquest, the Catholic Church, and particularly its orders of friars, applied a technology that arose from a new conceptual revolution, to multiply artificially the number of bilinguals, and especially of bilingual priests. 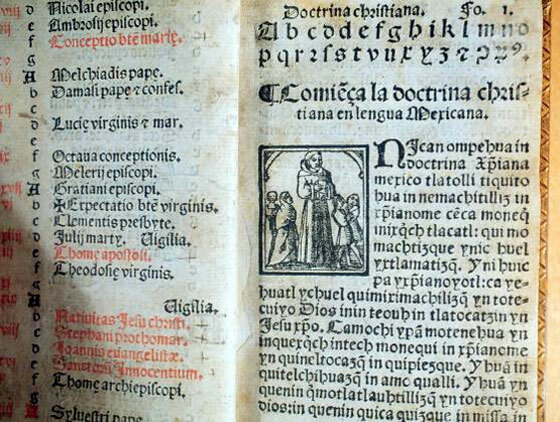 This was the advance now known as “grammatisation”, beginning in the late 15th century with Spanish and Italian, but then spreading all over western Europe: in this new movement, contemporary with the Renaissance, it was recognized that every language (not just classical Greek and Latin) could be characterized in an Arte, a treatise of grammatical rules, which – with a dictionary – could be used to learn the language as an adult, by the same familiar methods that all learned men had learnt their Latin. Language learning was – in principle – a solved problem. After a decade of research, readers, grammars and dictionaries began to be published. 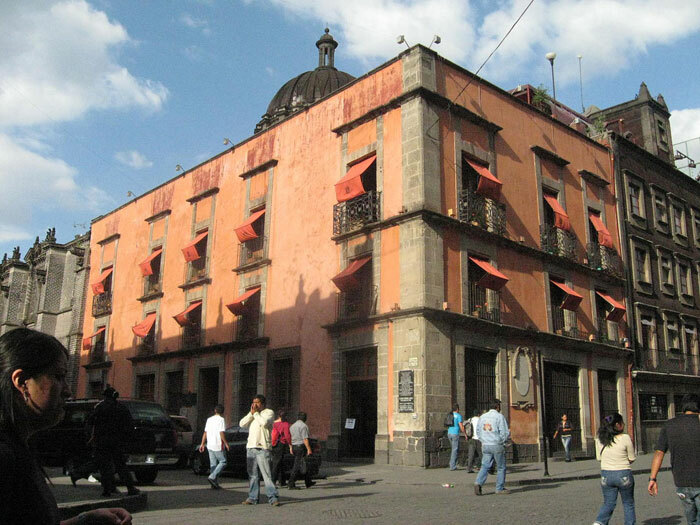 Printing presses were installed in Mexico City in 1535, an immense investment in technology – just a generation after the first in Madrid in 1500. 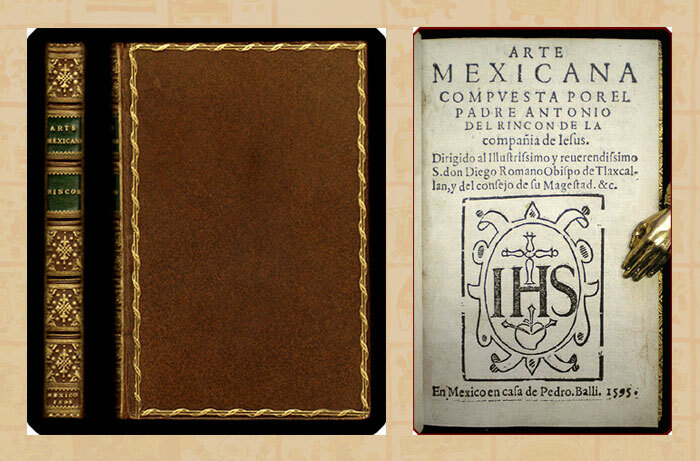 Their first known product, the Breve y más compendiosa doctrina christiana, which came out in 1539, was for ecclesiastical use, and written in Nahuatl. 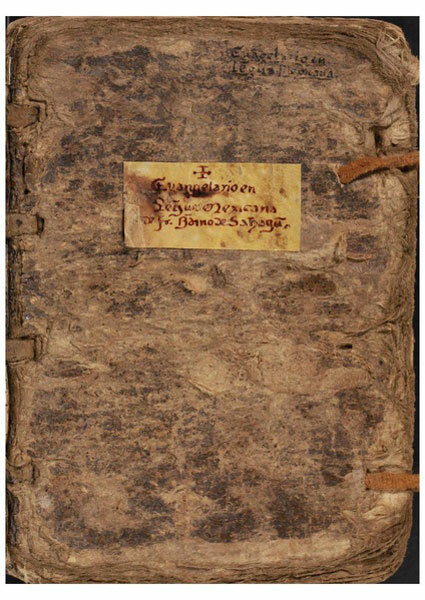 In 1546 it was followed by Fray Alonso de Molina’s Doctrina christiana breve traduzida en lengua Mexicana, and in 1547 Arte de la lengua mexicana by Father Andres de Olmos, and an accompanying volume Vocabulario de la lengua mexicana. In this, Lengua mexicana meant Nahuatl, at the time still the principal lingua franca of New Spain, as it had been of its predecessor, the Aztec (Mexica) empire. But the intent to involve Nahuatl in Christian worship was finally frustrated. In the Spanish empire (as in the Portuguese), the natives of America were never adjudged worthy to be consecrated as priests: this presumably on grounds of racial prejudice. 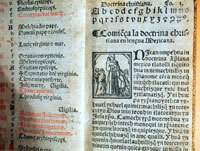 This prohibition was included in a formal text of the Third Council of Lima in 1583. 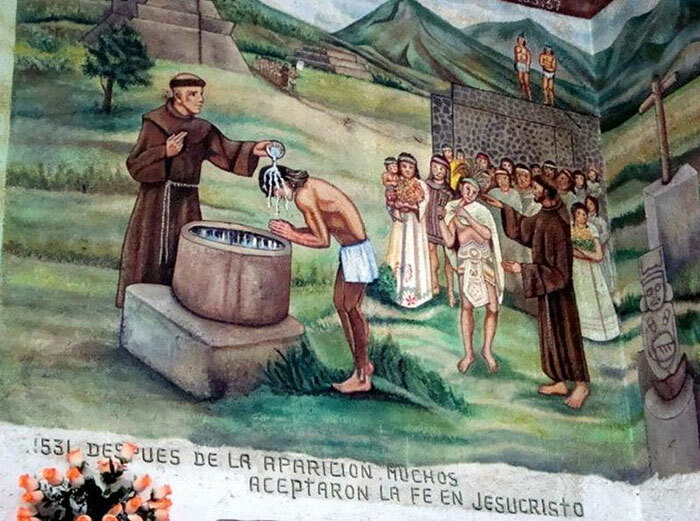 The Franciscans, having been the first missionaries in Mexico, had long aspired to bring up an indigenous priesthood, and indeed had founded a special college for Indian youth in the 1530s at Tlatelolco near Mexico city. 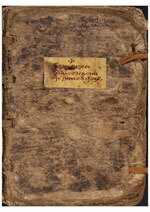 But it functioned only between the 1530s and 1550s, and its purpose was ultimately thwarted by the Third Council. 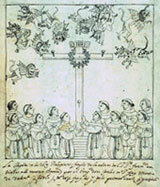 New Nahuatl literature was composed also in the early attempts to win the Mexican people for Christianity. He had found this most effective in building enthusiasm, and continued it throughout a whole celebration of Christmas. The children proved gifted in picking up the new songs, and there was some spontaneous creation of new ones, or new words for old song-tunes. A new tradition of Christian song was born. Sahagún’s work is not arranged around the Biblical book of Psalms, but the feast-days of the Catholic calendar. This means its content can range freely over significant moments in Christian history, provided only they are linked with some saint. It is a purely Christian work, with no allusions to the original Psalms of King David. 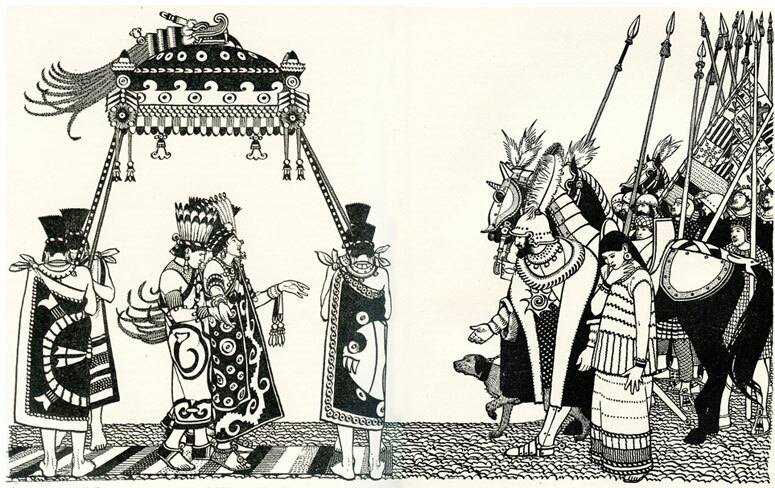 It can hardly recall the characteristic spirit of Aztec poetry – a kind of elegant despair before an unyielding universe – but it is a highly competent stylistic pastiche of it. 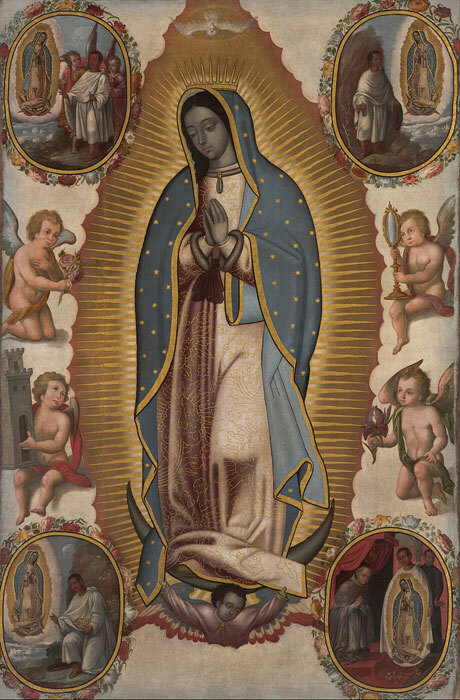 Finally, we can mention another story, among the best known in the early years of Christian America: how the poor self-effacing Mexican Juan Diego was called by a mysterious lady – none other than the Virgin Mary – to visit the newly appointed bishop of his town, and so persuade him to dedicate a chapel to her worship. It is a tale of humble piety, reinforced through astounding miracles. 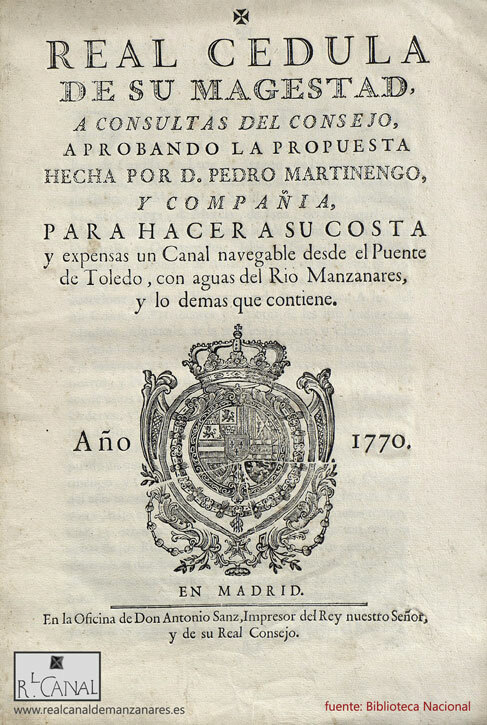 It is told, in perfect Nahuatl of literary quality, in a tract entitled Huei tlamahuiçoltica “by a great miracle”, published in 1649, a century after the events that it recounts (“Ten years after the City of Mexico was conquered, with the arrows and shields put aside, when there was peace in all the towns... the year 1531...”) . Although there are – of course – secular doubts as to its historical truth, there are none as to its sincerity, or its significance in the story of how Mexico came to accept the Catholic faith from conquistadores. Faced with this new attitude to languages, one that would be propagated thoughout the Spanish empire, Nahuatl was degraded socially. The motive for this disruptive new policy was external, coming from new ideas of the European Enlightenment. They suggested that rulers might increase both general well-being, and their own wealth, by imposing new, more rational, government on their subjects. Linguistic diversity, seen as a needless complication, was an immediate target. So was the temporal power of the Catholic church, which was becoming resented for its old-fashioned ways: its tradition of easy-going acceptance of the old “savage” languages could be used to attack it. Once the single and standardized lengua general of Mexico, it is now a language of scattered village communities, formalized by no norm at all, so that the Summer Institute of Linguistics, in a survey of the 1980s, discerned 19 quite different varieties. • Pic 18: Map from the Summer Institute of Linguistics website on Nahuatl - http://www.mexico.sil.org/language_culture/aztec.